AllegroMedical.com presents The Special Tomato® Floor Sitter - Seat And Wedge - Size 1. The Special Tomato® adaptive seating systems are available in various sizes, colors and modular offerings. The Special Tomato® Soft-Touch™ FLOOR Sitter offers proper seating positioning for children with mild to moderate physical involvement. The Soft-Touch™ FLOOR features a rigid base that provides superior stability and lifts the Soft-Touch™ Sitter slightly off the floor. The “close to the floor position” brings children with special needs to the level of their peers while playing or during circle activities. 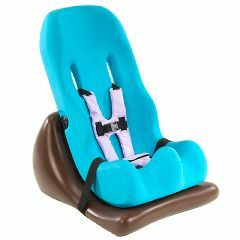 Made from a soft-to-touch material that is antimicrobial, impermeable to fluids, latex free, peel- and tear-resistant, the Soft-Touch™ Sitter offers a comfortable and supportive seating experience. The Special Tomato® Soft-Touch™ Sitter can be positioned on the FLOOR SITTER Wedge in several different angles, providing the perfect support for your child. Weight capacity: 20-30 lbs.